The essence of this dish is simplicity. It only takes simple ingredients and basic cooking techniques to enhance the natural flavor of these meatballs. Serve with crusty bread and feta cheese or even on top of rice, in lasagna or with your favorite pasta. Transfer all ingredients (but only 1/4 of tomato juice) in a bowl, season with salt and pepper and mix really well with your hands until combined. Make walnut-sized meatballs or larger if you wish. In a pan heat 5 tbsp oil on high heat and cook meatballs on all sides until nicely colored. 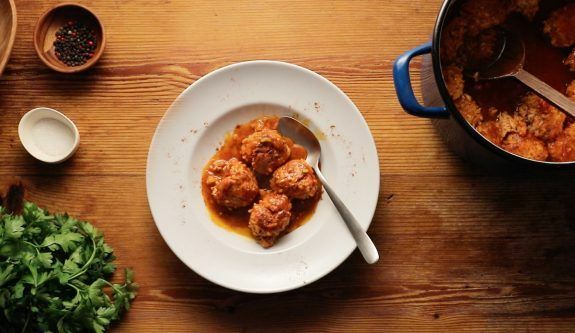 Stir in remaining tomato juice, 1 cup of water and when it comes to a boil, lower down heat, cover with lid and simmer for 25 minutes or until meatballs are cooked through and sauce thickens. Add extra water if necessary. Serve warm with crusty bread and extra paprika.